All girls like to feel like princesses every now and then, and I am not different. I don’t pay too much attention to fashion, I don’t really buy clothes, and I don’t care about getting married at all. But I still like them pretty dresses (looking never hurts, right?) and when I was a child I did dream of having my own castle one day, where I could walk around all princessy-like in a fabulous dress, eat a fabulous meal in a gorgeous dining room and feel very privileged. Who knew that this dream would come true one day? I certainly wasn’t expecting this when I decided to visit Bergamo. 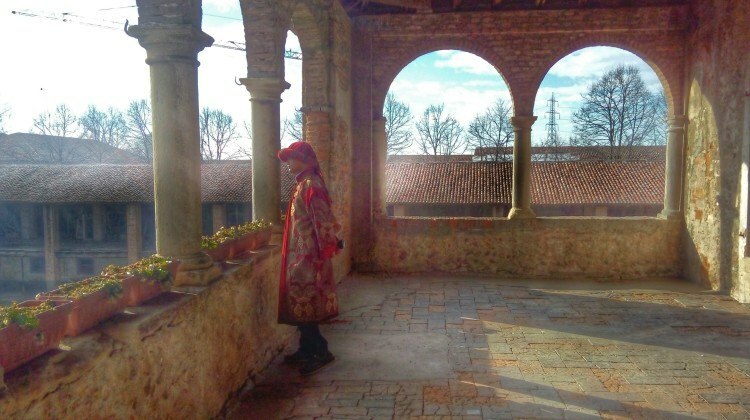 Not far from Bergamo, in Italy’s northern region of Lombardia, there is a castle called Castello di Malpaga. Not too many people visit this part of the region, generally opting for more known destinations such as Milan or Lake Como. I wonder why, since this area has just as much to offer, and it is simply gorgeous. Anyways, the fact that not too many people know about the gorgeous areas that surround Bergamo means that I had a whole castle almost to myself when I visited on a very cold February morning. As soon as I arrived, together with three more visitors, I knew I was in for a good time. The castle is gorgeous, to put it mildly. 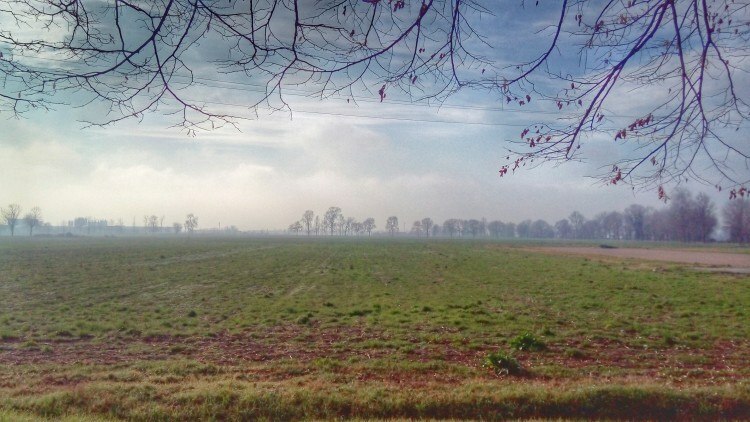 Completely surrounded by the countryside, it stood alone against the blue morning sky, almost demanding to be photographed. I then walked in and my oh my, could it be any prettier? It is perfectly kept, with frescoes, and even the fireplaces are still in place. Minutes later, we were introduced to chef Carlo, who was to be our cooking teacher that day. Everyone knows I can’t really cook. Or better, I can’t be bothered to put the ingredients together. I am very lazy, and I would be happy eating the same thing over and over for the sake of making things easier. This doesn’t mean I don’t know good food from bad food – because my mother is quite the chef and she’s all about fresh ingredients and proper cooking. What this means is that although I am a hopeless cook (burning meat till it is inedible, forgetting to take the cake out of the oven, and stuff like that), I do like good food and have quite a palate for that. Chef Carlo proved to me that if I only put in a little bit of effort, if I only show love for the ingredients I am using, I can produce a great meal. 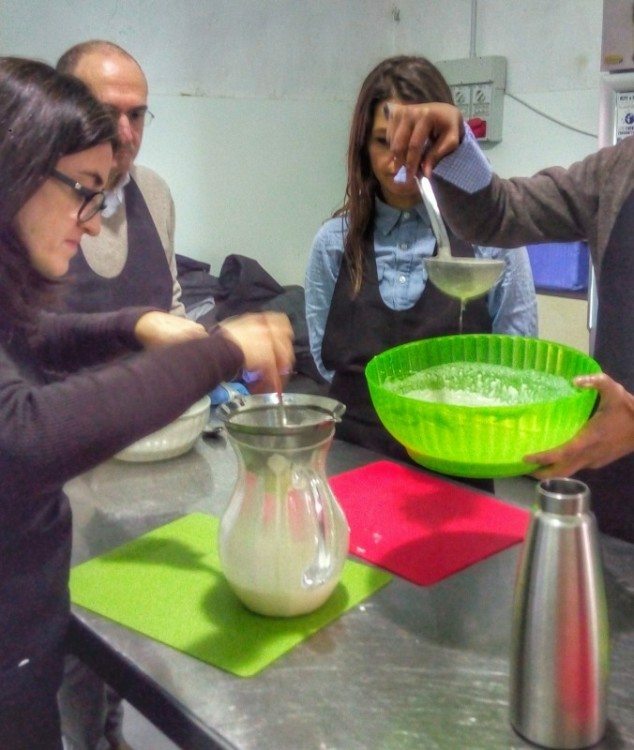 Our cooking class started off by preparing an Italian staple dessert – tiramisù. I whisked together caster sugar and egg yolks, then added them to a mixture of mascarpone cheese (a very creemy cheese that is typical Italian) and cream. The mixture turned out to be quite liquid. I then passed it through a very fine strainer. Had we followed the normal procedure, I would have had to whisk the mixture until it got creamy and fluffy. But apparently there is a much faster way to do this, so I poured it into a syphon, where Carlo proceeded to add oxygen. This pretty much incorporates air into the mixture as if it had been whisked and when poured the texture is fluffy and airy (and delicious). Next, we put savoiardi bisquits on small bowls, poured coffee over them, poured the cream directly from the syphon and then sprinkled everything with powder cocoa. It was as easy as that. The cooking class went on and Carlo showed us how to prepare a good egg pasta. All is needed is a very good flour (not the ones that can be easily found at the supermarket, but organic ones, which are less refined and have much less gluten) and very fresh eggs. We had to mix the two ingredients in a bowl and then eventually had to move it on the table, where we had to use all my strenght to work it into a smooth ball that could go into the pasta machine. We prepared very thin sheets of pasta, which we then filled with a pumpkin mixture to make pumpkin ravioli. We folded the thin sheet, using a lightly beaten egg as glue, then pressed lightly and used a mold to give it the desired shape. The ravioli were later boiled in salted water and served with a very simple sauce made of butter and sage, and served with freshly grated parmesan cheese. Last, we prepared a steak tartare. The key to a good steak tartare is using top quality and very lean beef. This has to be chopped very finely, then mixed with some extra virgin olive oil and lemon. 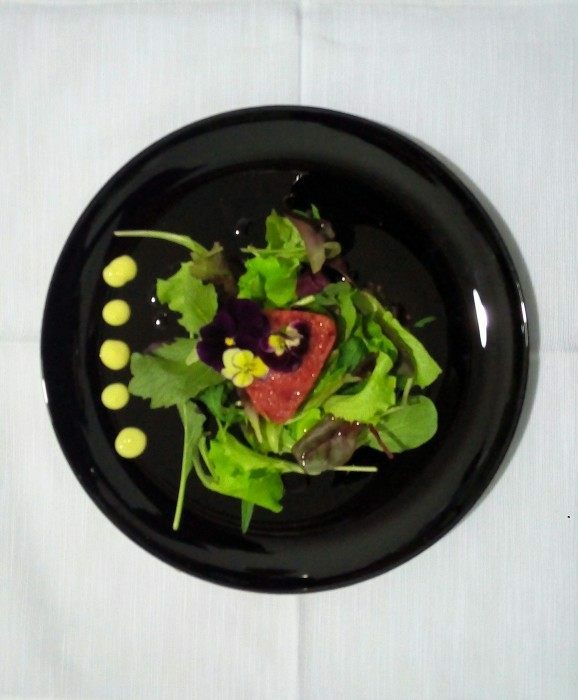 It is then molded into shape and decorated to prepare a gorgeous and colorful looking dish. When everything was ready, were were showed to the most amazing dining room I have ever seen. 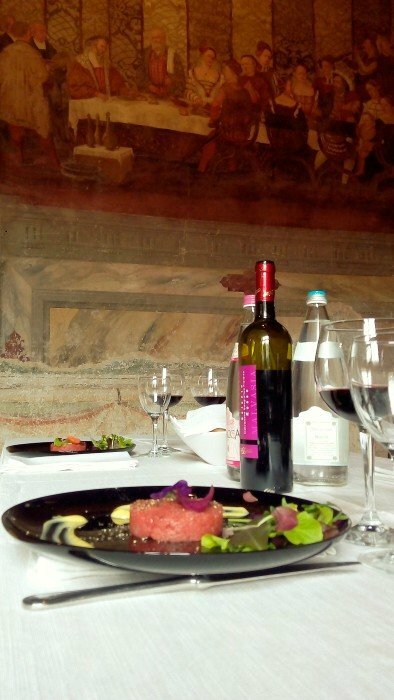 A table had been beautifully set for the four of us in a 15th century dining room decorated with beautiful frescoes. An original fireplace was right behind us. We sat down in disbelief, about to eat one of the most delicious meals ever and which we had contributed to prepare. It was all surreal! I could not believe how lucky and privileged I felt. As if all of this was not enough to make me feel like a princess already, after lunch we were invited to change our clothes, to wear traditional 15th century attires. We’d be having our guided tour of the castle in those dresses. I felt like a child in a candy shop when I saw the selection of dresses I could wear, and I won’t deny that I tried a few before settling on a gorgeous green one. Do I look good in my princess attire? 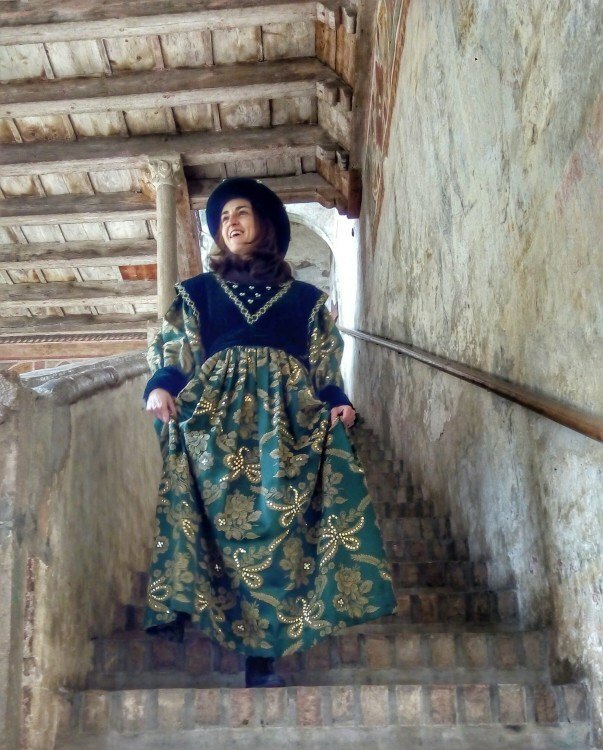 Roaming around the castle in those dresses, we understood how people living in the 15th century may feel. Those clothes were heavy and definitely not comfortable to walk around. Yet, the dresses added to the experience and we could not help but acting very regal throughout the tour. Except the moment when we were all staring at our smartphones in a scene that looked a lot like a back to the future kind of moment. 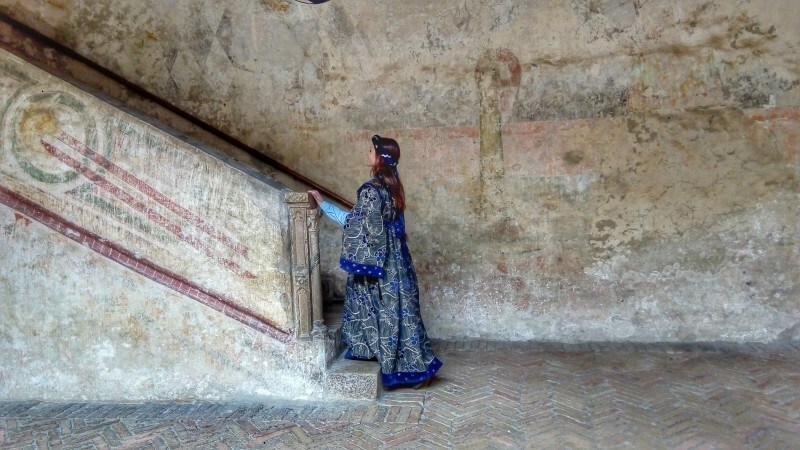 Exploring a beautiful castle, eating a regal meal, wearing a princess-like dress: my dreams came true at Castello di Malpaga. Have you ever visited a castle? What did you love the most about it?